The fashion for crossover wagons shows no signs of fading. You can have anything from a Subaru Outback – the company being one of the originators of the trend – to the V8 Holden Adventra... and nearly every size and power in between. Crossover wagons bring the benefits of greater ground clearance and drive to all wheels, without the unwieldiness of a full-size four-wheel drive. They’re also lighter, and so have better fuel economy and performance. 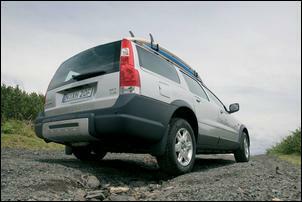 And at 1655kg, the lightest in this class is the Volvo XC70. Put that weight together with a 154kW five-cylinder turbo engine, equip the car with an intelligent mix of features, and for $69,950 you have a highly competent package. The engine is both an asset and a debit. On the negative side is its growly, slightly coarse character. It throbs at idle and has a distinctive note when working hard. 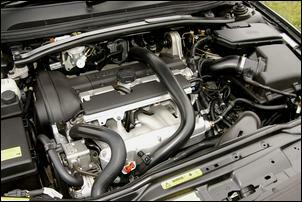 In short, its NVH – noise, vibration, harshness – is not up to the standards of a $70,000 car. But on the plus side, it boasts a very wide spread of torque (the peak of 320Nm is held from 1500-4500rpm) and together with a 5-speed sequential shift auto trans, provides surprisingly strong performance. Volvo claim a 0-100 km/h time of 8.0 seconds but we’d put it at least a second slower. No matter, in the normal cut and thrust of urban traffic, its traction and bottom-end grunt allow for an effortlessly quick getaway, and when loaded-up, passing performance on the open road is quite adequate. The engine requires a diet of 95 or 98 octane premium unleaded but compared with other vehicles of this type, it doesn’t consume much of it. Fuel economy on test was 12.4 litres/100 km and the official government test is 11.1 litres/100 km – excellent results. The ride and handling depend somewhat on the option pack(s) specified. The test car came with DSTC (Dynamic Stability and Traction Control) at $2100 and Four-C (which must be ordered with DSTC for a total additional cost of $6050). The stability control upgrade (all XC70s come with traction control) provides a substantial safety improvement but we’re less convinced by Four-C, which is Volvo’s Continuously Controlled Chassis Concept active suspension system. Switching the Four-C button from Comfort to Sport noticeably hardens the suspension but the handling balance doesn’t seem to change greatly – you can have understeer or understeer. However, the handling – especially with the DSTC – is safe and predictable. As befits a dual-purpose machine, the tyres – 215/65 Pirelli Scorpions on 16-inch alloy wheels – are at home on dirt and snow, and the suspension travel is excellent. The XC70 can be happily driven through 30cm deep potholes with barely an in-cabin bump being felt. (And that’s the case with the Four-C button in either position!) Ground clearance is 209mm and independent suspension is used all-round. However - especially in sports suspension mode - impact harshness over small bumps is higher than expected, and the steering can kick back when the car is driven hard. The all-wheel drive system uses electro-mechanical Haldex control, where typically the front wheels are driven and the rears are brought on-line only when slip is detected. The system isn’t seamless – the fronts can be felt turning faster before the rears kick in. There is no centre diff lock and the gearbox is not provided with low-range ratios. The dashboard and driver controls are clear, logical and effective. Besides the extensive steering wheel controls, where the buttons have sharp edges and don’t always sit flush, barely a criticism can be made in this area. The interior equipment is extensive – leather, dual zone climate control, electric driver’s seat with memories (passenger side electric seat is an option), sunroof, excellent trip computer, auto-dimming central rear vision mirror (and water repellent glass on the side mirrors! 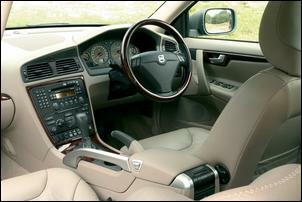 ), heated front seats and an 11-speaker CD stacker sound system. Also fitted to the test car were rear park assist and navigation, the latter with a screen that rises from the centre of the dash. As expected in a Volvo, there are airbags everywhere with dual-stage front air bags (driver and passenger) and inflatable curtains for the front seat and rear seat passengers. With new seats for this model, it’s comfortable inside the cabin –– but rear passenger space is never generous. Especially if the front seats are set low, those in the back are cramped for foot-room – the back is best suited to children or teenagers rather than adults. However, the rear doors open wide. 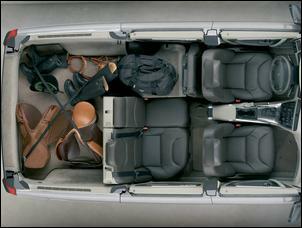 Load space is good, helped by the way in which the rear seat back can be laid flat on a 40:20:40 basis. The rear seat squabs lift and then the head restraints are easily tilted (they don’t need to be removed) before the seat is folded to allow the creation of a perfectly flat floor. Also provided in the rear are shallow underfloor storage areas and a removable cargo blind. 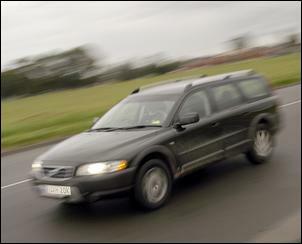 The Volvo XC70 was provided for this test by Volvo Australia.